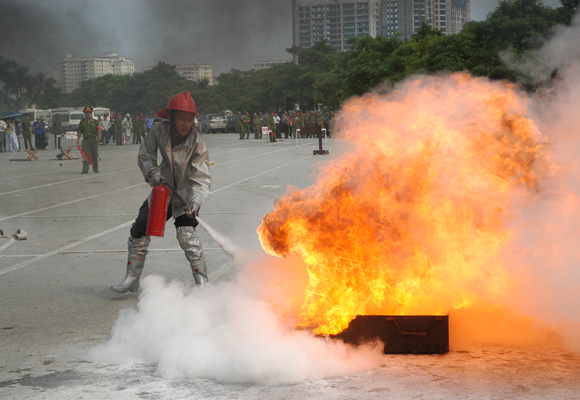 THUA THIEN - HUE (VNS)— The Ministry of Labour, Invalids and Social Affairs yesterday launched a campaign to prevent fire and unintentional explosions at work places in central Thua Thien - Hue Province. Each year, the ministry organises a week for the campaign in different localities in an attempt to reduce accidents in industrial parks around the country and improve working hygiene and safety, as well. This year's week, which is the 16th to be held, has been held at the province based Phu Bai Industrial Park. Speaking at the launching ceremony yesterday, Minister Pham Thi Hai Chuyen said 2,700 fires and explosions occurred nationwide last year, killing 100 people and sending 200 others to hospitals. The incidents resulted in losses of VND1.7 trillion (US$80 million). Chuyen said the number of incidents was 900 cases more than in 2012. In addition, the country had 6,600 labour accidents, as 627 workers died and 1,500 were injured. The sectors with the most accidents were construction, minerals, electricity production and maintenance, and mechanical manufacturing. The main causes of accidents were poor safety equipment for workers and a lack of safety procedures at work. Chuyen demanded that employers at industrial parks comply with regulations on working safety and conduct frequent training to raise awareness among workers. She urged agencies and offices to have tighter monitoring and apply stringent penalties to employers who violate safety regulations. The International Labour Organization (ILO) also took part in the ceremony, offering messages to raise the international profile of Vietnamese goods, thanks to the safe working environment.